The largest Petunia flowers we have ever seen. 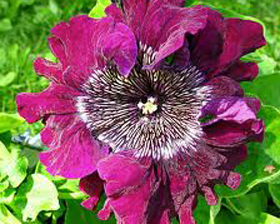 Robust plants produce huge 15cm wide exotic looking frilly blooms, in an attractive mixture of light wine red and purples, each with rich veining and attractive dark eyes. An eye-catching addition to borders or containers. Sow February to April. Sow seed on the surface of lightly firmed, moist seed compost in pots or trays. Lightly cover the seed with a fine sprinkling of vermiculite. Place in a propagator or warm place, and keep at a temperature of between 21-25C. After sowing, do not exclude light as this helps germination. Keep the surface of the compost moist but not waterlogged; germination will usually take 10-21 days.